The brochure on the 175th anniversary of hop growing in Tettnang. In comparison to other growing regions in Germany, the history of the Tettnang hops is still very young and owes its beginnings to a crisis situation affecting the population. 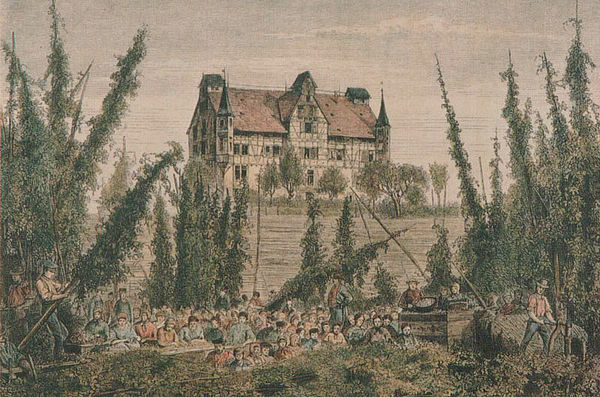 After several failed harvests and a widespread cattle plague, and also as a consequence of the Napoleonic wars, farming in Württemberg was undergoing a monumental crisis. This came to the attention of King Wilhelm I (founder of the Cannstatter Volksfest). In 1819 he urgently recommended the cultivation of hops. In 1822 he ordered the first trials in Hohenheim. 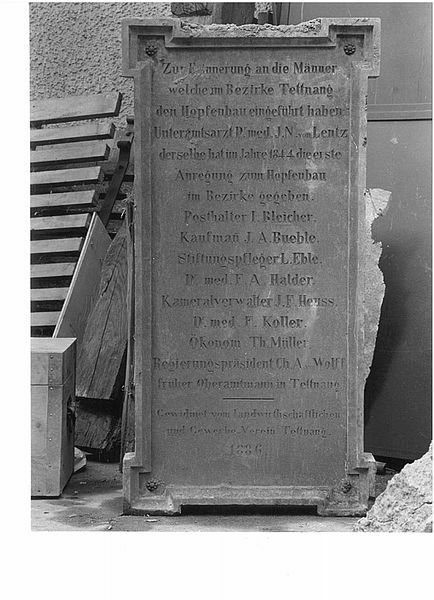 And so seven citizens of the town, whose names can still be read on a plaque honouring them, and junior medical officer Dr. Fidelis von Lentz who was working in Tettnang (“Where vines grow, hops must surely also flourish!”), took the initiative and in 1844 planted the first trial gardens in Tettnang. Within a decade, between 1847 and 1855, the area around Lake Constance had to a certain extent been opened up to the “world market” by rail, fostering its development. In the kingdom of Württemberg the famous “Swabian Railway“ stretched from Stuttgart to Lake Constance; Bavaria laid tracks from Munich to Lindau, and Austria brought the Eastern European region within reach with the Arlberg mountain railway to Bregenz. As a result, hop growing really took off in Tettnang. The arrival of pickers (handpicking until approx. 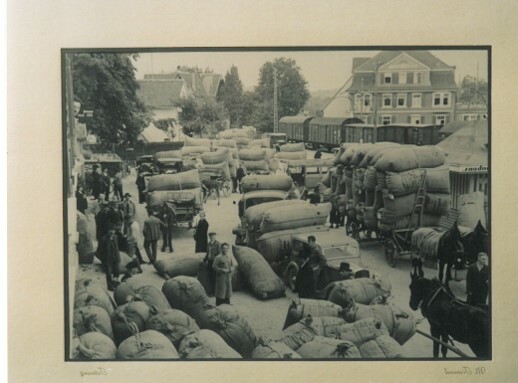 1960) and the transportation of the harvest to the customers and markets was now guaranteed. 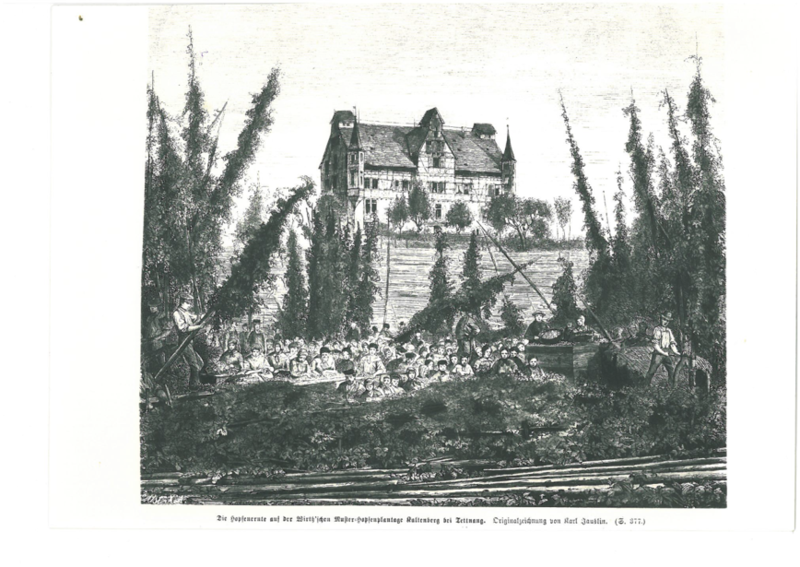 Around the time that Fidelis von Lentz recommended hop farming, over 300 hectares of grapevines and only three hectares of hops were being grown in the region around the then small town of Tettnang. However, within a decade the area dedicated to hops had raced ahead to 91 hectares and another ten years later (1874) hops had far overtaken viniculture at 400 hectares. As viniculture continued to decline, hop growing expanded further, reaching around 650 acres in 1884 and varying between 550 and 700 hectares at the turn of the century and during the first and second world wars. Israel Friedrich Wirth at the Kaltenberg estate (known as “Hopfenburg“ or “Hop Castle”) was another pioneer and supporter of the farming of Tettnang hops in this period. A number of inventions, such as hop drying, trellis construction, cultivation equipment, etc. are credited to his pioneering spirit, which he collected together in his “Wirths Hopfenbuch” published in 1875. Also in 1875 he brought the first German hop exhibition to Tettnang, initiated quality competitions and regularly won gold medals for the finest aroma hops from Tettnang in international competitions. After 1945, when government-controlled cultivation of hops came to an end, Tettnang also developed internationally to become a recognized producer of the finest aromatic hops. 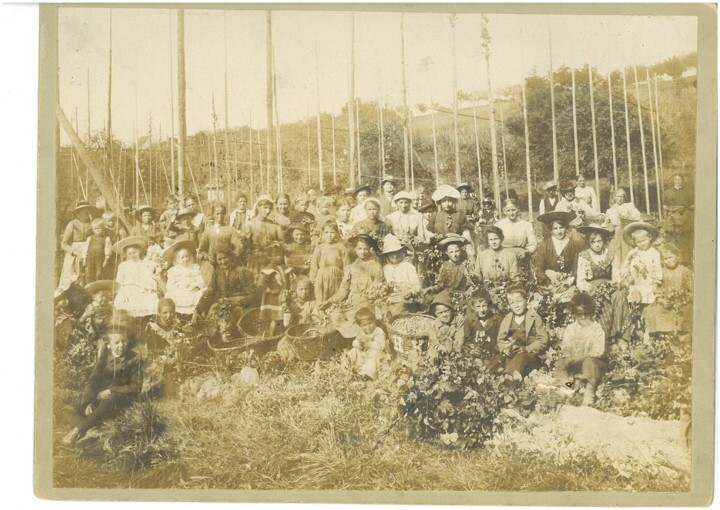 In 1947 the growers organized themselves into the newly founded Tettnang Hop Growers’ Association for the first time. The years 1950–1970 can only be described as the age of mechanization. In 1956 the first four hop picking machines arrived in Tettnang. In 1959, the Tettnang growing region achieved the highest ever number of practising growers with 1382 hop farms, albeit with only 0.57 hectares of hops planted per farm (a total of 785 hectares). 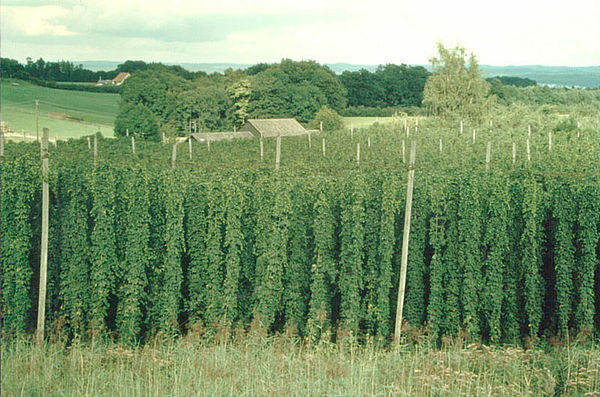 1973 is regarded as a breakthrough year for hop cultivation and research – thanks to the establishment of the state of Baden-Wurttemberg’s Tettnang-Straß hop research station, which is still active today. The deliberate and consistent selection of Tettnang variety clones and the first “production” of the world’s first virus-free hop offshoots in 1984 are just a few examples of its work, which provides the basis for the region’s competitiveness today. In 1975 there then followed the foundation of the Tettnang Hop Growers’ Association which was merged with HVG Elbe-Saale and HVG Hallertau to form the HVG Hopfenverwertungsgenossenschaft in 2001. Driven by successful exports to the USA and Asia, the Tettnang growing region was at its largest in 1997 with 1,659 hectares under cultivation. The introduction of the “Neutralen Qualitätsfeststellung (NQF)” (neutral quality inspection) and integrated production represented a quantum leap in sustainable production and quality in 1993. 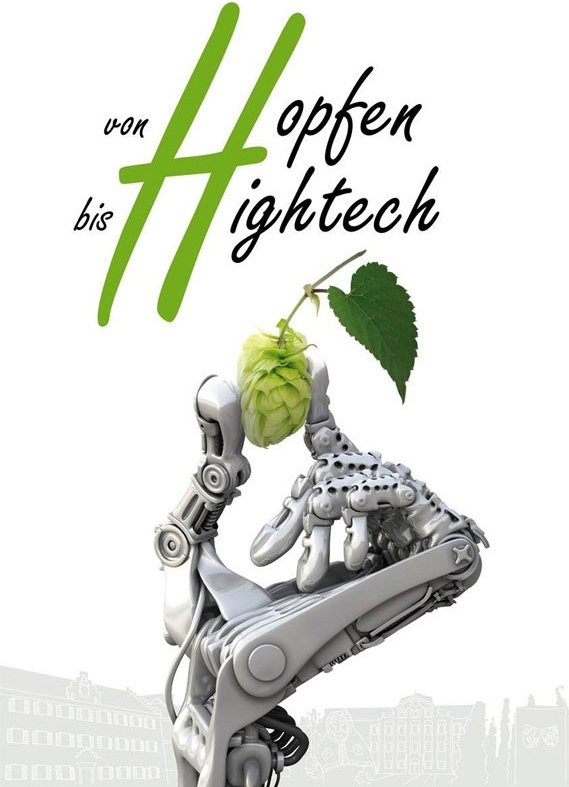 A quality assurance system under the label Qualitätszeichen Baden-Württemberg (QZBW), the introduction of a plant health monitoring system in 2011 and the implementation of a sustainability concept from 2014 were further consistent steps on the road to offering and ensuring top quality and security for national and international brewery customers. In 2010, after ten years of testing, Tettnang received brand protection in the form of a “protected geographical indicator” (PGI) granted by the EU in Brussels. In all its diversity, Tettnang continues to define itself into the future as an aromatic hop-producing region. In the nineties there was another major change when the growing region decided to cultivate other varieties in addition to the noble local Tettnang and Hallertauer Mfr. varieties. This decision helped to spread the economic risk, flattened out peaks in busy times and made it possible to offer customers the whole range of varieties in the “Tettnang Hop Shop”. Nevertheless, the noble Tettnang aroma variety remains the core competence of Tettnang hop farmers with around 60% of the cultivated area, supplemented by the Hüll varieties and even the new “flavor hops”, which they have been growing since 2012. Tettnang hop growers will remain in close contact with their loyal customers of many years, and will also seek out new contacts with interested creative brewers at brewing fairs and breweries in the local area and beyond. In line with the trend towards concentration in both the brewing industry and the hops trade, the number of growers in Tettnang is also shrinking (the owners are drawing ever closer together as the number of farms decreases and the business environment undergoes change), while at the same time each grower is becoming bigger and more productive. 132 farms are currently achieving an annual production of between 2,250 and 2,750 tonnes on around 1,400 hectares (approx. 2.5% of the total area under hop cultivation around the world), which is generally combined with the full gamut of fruit farming in the area around Lake Constance with its favourable climate. And if the expression “no beer without hops and no hops without beer” should continue to hold true over the next 175 years, which is quite likely, then the finest aroma from Tettnang will continue to find its way into brewing kettles all over the world to finish and refine speciality beers in the premium segment. New hop growing areas with new flavor varieties for the global craft beer movement are spreading rapidly throughout the growing region.